Sitabdiara: Senior BJP leader L K Advani on Tuesday began his 38-day Jan Chetna Yatra from Sitabdiara to take on the UPA government on the corruption issue and press for return of black money stashed away abroad. “I am formally launching my Jan Chetna Yatra against corruption and for bringing back black money stashed away abroad," Advani said at a public meeting at Gandhi Maidan, the starting point of the yatra which was flagged off by chief minister Nitish Kumar. Drawing a parallel between the circumstances prevailing then and now, Advani said, “Corruption should end in this country. There should not just be a change of leadership but also a change in the system. “People have today lost faith in the potential that this country has. The biggest achievement of this yatra would be to restore that belief," he said. Advani said the inspiration for this yatra had come from the work carried out by Jayprakash Narayan. The 84-year old leader also emphasized that the yatra is aimed at good governance and clean politics, as also the issues of Lokpal and for bringing back black money stashed away abroad. “The success of all the past movements have been in creating awareness among the people," Advani said, adding both the freedom struggle and Jayprakash movement had a similar aim of educating the people about the atrocities of the British and the corruption in Congress regime respectively. The yatra will go through 23 states and four union territories. Advani, who is undertaking his sixth yatra, will visit the North-East, Andaman and Nicobar Islands, Jammu, Gujarat, the southern states as well as the poll-bound states of Uttar Pradesh, Uttarakhand, Punjab and Goa. Soon after his arrival from Patna by a chopper, Advani, together with Nitish Kumar, his deputy S K Modi, Leaders of Opposition in the Lok Sabha and Rajya Sabha Sushma Swaraj and Arun Jaitley respectively, visited the ancestral house of late Jayaprakash Narayan and garlanded his statue. Advani’s rath-yatra will cover around 7,600 km and nearly 100 districts across the country. The senior leader said the 21st Century belonged to India and “we should take a pledge to ensure that the country emerges as one of the foremost nations in the world." 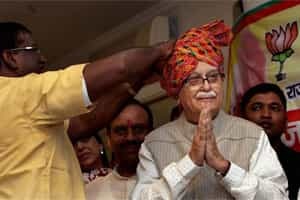 Advani also praised the Bihar chief minister, saying he had brought about a sea-change in the state since the NDA government came to power in 2005. “I had only once requested him to flag-off the yatra and he had readily agreed," Advani said. In his speech, Kumar welcomed Advani for choosing Jayprakash Narayan’s birthplace and his birth anniversary for starting his yatra against corruption. He enumerated the various measures taken by his government to fight the menace. He recalled that the JP movement had also started in Bihar and said nobody had then thought that the Congress will be voted out of power. Extending support to Advani’s yatra, Kumar said, “We don’t promise support only by words but also by deeds." Swaraj and Jaitley were lauded by Advani for effectively taking on the UPA government in Parliament not only on the issue of corruption but also on other issues. Advani said he was astonished that electricity has reached the village, the birth place of JP, only in 2011 despite India getting its freedom in 1947. This was only because of the initiative of the NDA government led by Nitish Kumar in Bihar, he emphasized. Praising Kumar for bringing about development, Advani said he knew Nitish as he had worked with him for six years when the NDA, led by Atal Bihari Vajpayee, was in power. “The day Nitish took over the reins of the state, I became confident that there will be change.... now he has brought a big difference to the situation as compared to 2005," he said and lambasted the erstwhile Lalu-Rabri government for the backwardness of the state. He said till 1997 the condition of roads in the state was very poor with potholes seen at most of the places. “But I am happy now to see development and changes in Bihar after the six-year rule of the NDA under Nitish....there is still a lot of work being done because of the scope." He claimed that the NDA government in Bihar had been inspired by the six-year rule of the alliance at the Centre. “Good governance can lead to development and that is being witnessed here. My yatra is meant for good governance and clean politics," the BJP leader said. Giving details of the steps taken by his government to stamp out corruption, Kumar said the state government had enacted the Bihar Special Court Act, 2009 with the provisions of confiscation of properties of corrupt public servants. “I have fulfilled the election promise of confiscation of the palatial building of a corrupt public servant where a full-fledged school is functional now," he said. Kumar also expressed happiness over the state adopting initiatives taken by his government to ensure declaration of properties of chief minister, deputy chief minister, ministers and other public servants to place the details on the government websites. “Even the UPA government at the Centre has followed suit and declared details of assets of ministers," he said. Speaking on the occasion, Jan Chetna Yatra Convenor Ananth Kumar said after JP, it was the second ‘Sampoorna Kranti´ (Total Revolution) being spearheaded by Advani to free the country from corruption and ensure that the 21st century would be the centenary of India.